You are here: Home > This is (snake) service! All hands on deck for this Amesthytine python beauty! Jax at the sharp end. Please do not kill snakes, they are vital to the ecosystem – a solution is at hand. 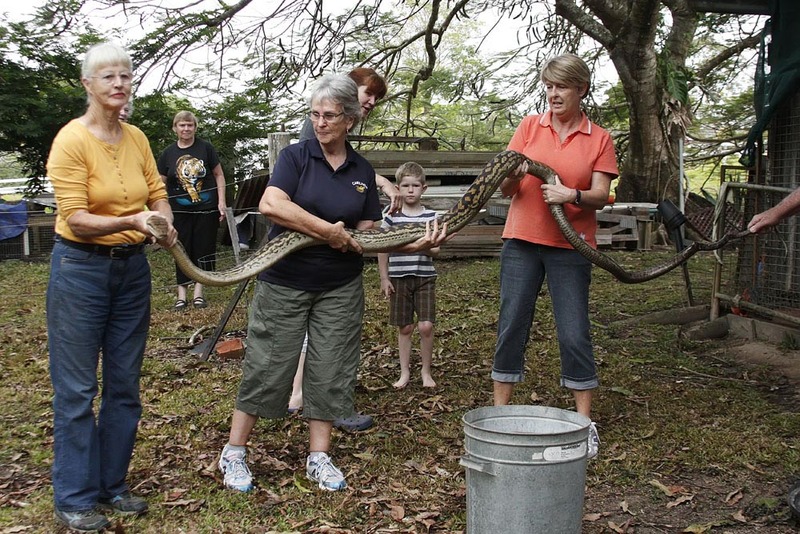 Kuranda Conservation provides a snake removal service. We will safely catch and re-locate your unwanted visitor. Phone (07) 4093 8834 only in daylight hours, and only in Kuranda. There are many different types of snakes in Australia, from those that could easily be mistaken for an earthworm through to giant pythons as thick as a man’s leg. They come in a kaleidoscope of colours and patterns, mostly mirroring their surroundings, with a few brightly banded and flecked, or giving off a brilliant sheen in sunlight. Snakes inhabit the full range of Australian environments from the rainforest to the outback, freshwater streams to the ocean, as well as our backyards. The more you learn about snakes the more you learn they are incredible creatures worthy of our respect and protection – and animals that we can learn to live with. If you would like to know more about snake and other reptile conservation visit the Australian government’s Action Plan for Australian Reptiles.